MyGroupNI are delighted to be involved in the Broadband Public Awareness Campaign which was launched on Feb 17th 2009 by the Banbridge District Council. People in the Banbridge District Council area are set to benefit from a public awareness campaign aimed at stimulating the uptake of broadband irrespective of the communications provider a consumer or business chooses. The extensive campaign kicks off on 23 February with adverts appearing in local papers, on billboards and flyers and posters will be distributed to local households, schools, community associations and groups. 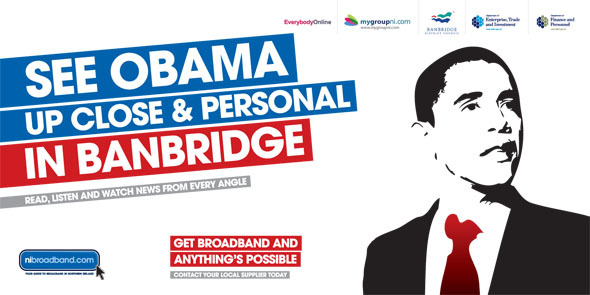 The Get Broadband & Anything is Possible campaign is targeted at the people of Banbridge informing them of the benefits that broadband can bring, how to get connected and where to locate more information on broadband services. Broadband is now one of the fastest growing consumer products of all time with a higher take up rate than televisions, CD players, video recorders or mobile phones. Frank McManus, Head of Wholesale Services, BT said “The Get Broadband & Anything is Possible campaign is a public awareness programme aimed at driving uptake and highlighting the benefits of broadband to the people of Banbridge. So look out for the adverts featuring the President of the United States of America! Broadband is well on the way to becoming a vital utility like electricity or water. It has the ability to dramatically change people's lives and create new business opportunities, it allows the download of files, music and video at much faster speeds and enables the user to send or receive emails with large attachments in seconds as opposed to minutes. The campaign has been fully supported by Banbridge District Council, joint funded by the Department of Finance and Personnel and endorsed by the Department of Enterprise Trade and Investment, MyGroup NI and Everybody Online. Visit www.nibroadband.com to find out more about broadband. In the year ended 31 March 2008, BT Group plc’s revenue was £20,704 million with profit before taxation and specific items of £2,506 million.